Just as the hard disk drive works on the principle of magnetism, optical disk drive works on the principle of optics. The optical disk drive is used to read and write digital data on compact disks(CD), Digital versatile disc (DVD) and blue ray disks. This is one device that can be used as both input (read data in) and output device (writes data out). Some of you might be thinking that optical drives are obsolete and the new laptops are designed without any optical drives. To some extent this is true but you cannot discard them altogether since these optical drives are still used for various important purposes. Apart from installing the operating systems the optical drives to date are still used to read old backups in organizations. The optical discs are more secure since the data contained in CD, DVD or blue ray disks cannot be infected with the virus. So it is still the preferred option to take backups. The another need to use the optical drive today is the availability of many movies and games in optical discs. But yes, you can download the same from the internet but that will consume so much of time and bandwidth which will not be worth since the movies and games are available in CDS or DVDs at a much cheaper price. A laser beam is used to read or write data on optical media disks. To read or write CDs, DVDs or blue rays, laser beams of different wavelengths are used. There are three components involved in reading the data. The laser beam itself, a lens that guides this laser beam and a photo-diode that will receive the light reflected from the optical disc. The same lens can be used to read/write CDs or DVDs but a different lens is used to read blue-ray discs. As far as the rotational mechanism is concerned, the optical discs maintain constant angular velocity abbreviated as CAV. 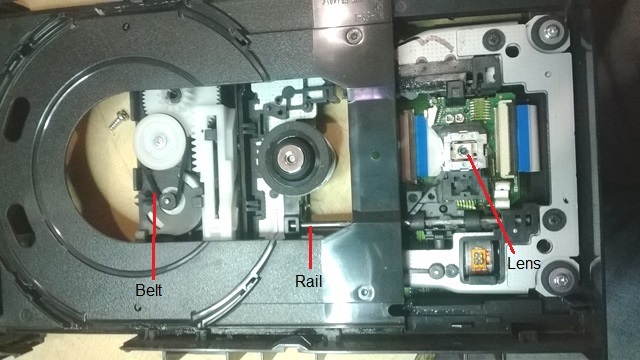 The optical drive consists of two motors. A brush-less DC motor which is used to rotate or spin the optical disc and a stepper motor that is used to move the lens in a linear motion. You might have noticed that DVD writers or Blu-Ray drives are marked with 4x, 16x or 32x. These are the speed capacities of optical drives. Typically, 16x means the optical drive can work at 16 times the speed of the base speed. In desktop computers, these is a 5.25” bay on the front side. The optical drive is connected to the motherboard through two interfaces. On is the 4-pin power connector that comes with SMPS and an SATA, IDE or SCSI cable for data transfer. The optical drives also come with USB port which is found on external optical drives and PCMCIA interface for laptop connectivity.